Paul Dart is sitting under a canopy of shiny silver baubles in front of a wall of fairy lights in his studio in Bermondsey, south London. It could be mistaken for Father Christmas’s grotto, as it is crammed with life-size reindeer and giant candy canes. As creative director of James Glancy Design, Dart, 62, creates Christmas-light installations in some of the most famous streets in the country, including those on Regent Street and in the St James’s region of London – a project commissioned by The Crown Estate. This year he was recruited by The Crown Estate to design the lights for St James’s and Regent Street. First he dreamt up the lights, settling on an angel shape. “I wanted the right balance of modern and traditional,” he says. Next he built full-size prototypes. 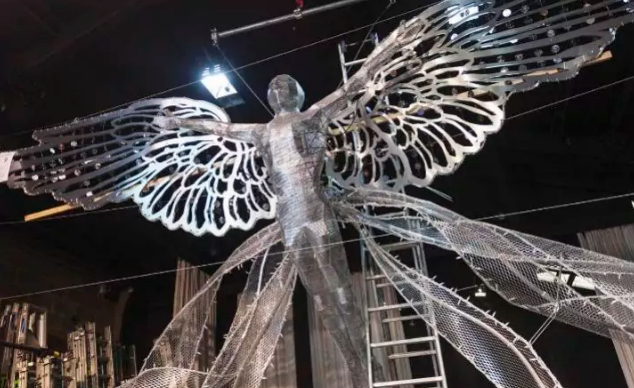 The angel shapes were cut from aluminium, with the wings and skirts welded on. “People always think that my job is just to pop a fairy on top of a tree, but it’s actually really technical,” he adds. Finally, the angels were sprayed with paint, and the bulbs were added by hand.